Lately we finished and apartment with great ecological and reuse solutions in Kadriorg in a Lender type of house. In this apartment were used almost all our fields of activity: natural interior finishing, restoring windows and doors, reusing old materials. We began the work in autumn 2011 and the work lasted for several months. First we restored the windows, the window borders and the front door. We also expanded the window boards as the reed board on the wall made the walls 50 mm thicker. We heat insulated the exterior walls with the reed board, on the internal walls we used reed mat. The bedrooms were plastered with the clay plaster as it creates somewhat better indoor climate than lime plaster and as people spend most of their time at home in bedrooms. Other rooms we plastered with lime plaster that is stronger and withstands better humidity, so it is good for the more actively used rooms like living room, corridor, kitchen, bathroom. We made smooth plastering, we restored the curved edges of the ceilings with the natural casein paint. The back wall of the kitchen work surface and the shower corner were covered with tadelakt. We also cleaned and jointed the chimney of clay bricks. Several old floorboards and planks from our store found a new life. From the cleaned floorboard we made several smaller and bigger shelves. An interesting solution was a cupboard made of old tall paneled wooden doors. The owners of the apartment made many works themselves (smoothing and oiling the floors and logs, painting the walls with casein paint), so they spent long evenings and weekends working. We have always had the opinion that everybody could do the easier works, that helps to reduce the costs and building your home yourself is a great pleasure. We liked to be part of creating this home. We liked the joy and the shine in the eyes of the client when they told us their new ideas. We liked that the young people creating their first home value the traditions, wishing to create a home with good indoor climate for them and for their future children. 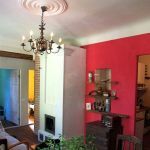 The plastered surfaces painted with natural paints, the old wooden floor finished with oil, the old windows and doors, nice oven, curved edges of the ceiling, rosette - this is a competent finishing in an apartment in an old wooden house. What a dedication and what a love! The comments from the owners: There are not many ecobuilders here in Estonia. We are very lucky that we chose Säästvad Ehituslahendused to help creating our home. Their craftsmen know what are the best solutions and they work with their soul and heart. Not just to make the thing, but also to have it nice and good. Of course there are also some problems and misunderstandings during the building process, but we solved them smoothly. During the building process it seemed like the men are not building for other people, but for themselves. When everything was ready and the men went to create some other homes it was quite sad that there weren't anymore nobody with who to talk about the building process and about other things. The result is like we wished and even better.